Before surgery, I thought about if it was really necessary. I am tall and have double eyelids. I had nose surgery, so I had a clear, pretty image. and my appearance looked like a country girl even with my nose job. When I realized that I got rejected by a guy I liked because of my appearance, I decided on my surgery. I wanted to show up with a pretty face and I wanted to give myself some confidence. 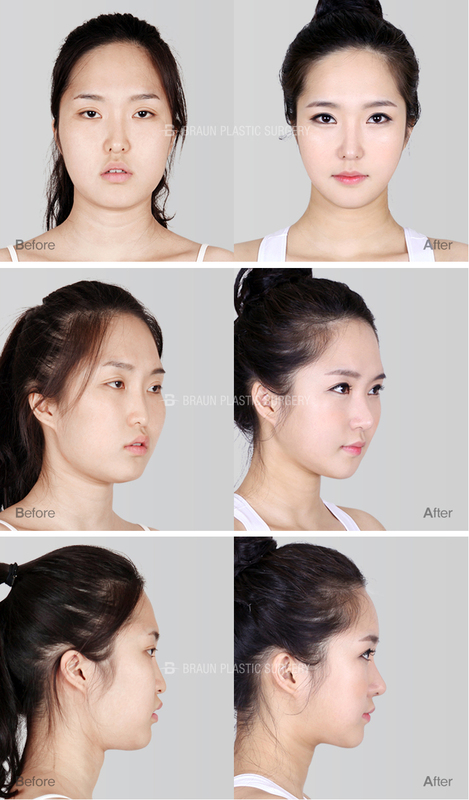 I consulted many clinics and I was worried since I wanted a lot of surgery at all at once. safety, and follow up care. It looked like it fit my expectations. Her face looked big because of her developed side cheek bone and jaw. Her eyes looked not clear. which made her face longer, wider, and dull. Eun-bi you are so pretty. You are bright. This is what I hear from those who I met after not seeing for a long time. I would’ve felt depressed if I changed completely or became one of those artificial beauties. my strength stands out and my weak points are gone. I thought the faces with surgery all looked same. my doctor made my unique individuality stand out and reduced my faults! Excitement and nervousness. I was anxious. I became more nervous as the day came closer. I was excited to be pretty but I was worried at the same time. My doctor made a joke because I probably looked too nervous. He explained the surgery nicely. The anesthesiologist said to count numbers and I did until 3 and fell asleep. and I felt dizzy and nauseated as I was getting out of anesthesia. I asked the nurses for help and they were very nice. They took care of me great, so I felt sorry. I focused on swelling management for my puffy face! My face was wrapped with bandages and a splint. and I was worried if it wouldn’t go away. So I asked about it a lot when I got postoperative treatment. If I can choose the clinic, I will choose Braun again. they were so nice and explained in detail. I really appreciated that. The swelling is going away every day!! The days 2~4 were hard but after that, the swelling was going away quickly. I was so excited for my prettier face. I was worried about the pain when I got my stitches removed but it felt great. After that the swelling was going away even faster. For swelling, the body type is important but the follow up treatment is also important. They did their role great. Braun has great postoperative treatment. they have various follow up treatments for nose surgery. My swelling went away fast because of weekly swelling treatment. After fat grafting, my skin got firm and I look younger than my age. Even in the morning, when my face is puffy, my face is still small and firm!! I love my face more. My face is pocket size! I check my face every morning when I wash it. and chin are and it’s so different from before. In the mirror, my chin line is different and my nose got sharper. My friends asked me where I got the surgery from. I was proud when I looked at the mirror and when my friends told me I am pretty, I was so happy. but I could eat other food without a problem. And 3 weeks after, I looked different. My wide and dull face became slim with clear eyes, nose, and mouth. I got a softer image. I am so excited to see what I will look like when all the swelling is gone. I became a pretty girl and I am changed. There are so many things that changed after 6 months. I am smiley and have a bright image which changed my personality. And the guy I liked treats me differently. I was so satisfied because I felt like I got my revenge. I did it because of him, but it changed my whole life eventually. I was so negative, but now I am so optimistic with self-esteem. I feel like I can prepare anything confidently. I had a 3D CT taken to check the result and the bones are healed. And the line is beautiful. I think Braun was a great choice! I am so satisfied!